Self catering accommodation at the The Quality Hotel & Leisure Centre, Youghal, 3 bedroom holiday homes brings the added benefits of being alongside the Hotels excellent Leisure Centre, bar, restaurantsand beachside site. Each of these holiday homes are equipped with a fully fitted kitchen, which includes washing machine/dryer, cooker, microwave, and dishwasher. Each has three bedrooms, 2 double rooms ensuite, and 1 twin room with a separate bathroom. 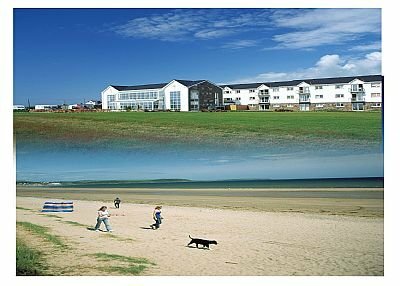 As residents you have free & full access to enjoy the Club Vitae gym, fitness classes, extensive 20m pool with sea views, kiddies pool, steam room, sauna, Jacuzzi, kids camps & floodlit sports pitches, fitness studio and our 4 Treatment rooms at La Spa Vitae which includes the Balneo Therapy Suite. On Site we also have a supervised dro p-in centre, childrens games room, movie room and the Dolphin Playcentre and Club for the younger guests. Kids camps are available during weekends & daily all July & August. In Lannigans Restaurant, the food style takes its influences from an international theme of dishes from around the world. Our signature dishes such as our sharing and combination platters, along with our enchiladas will have you spoilt for choice with some 47 dishes to choose. All guest have free & full access to fabulous facilities in our on site leisure centre, and of course the miles of sandy beach are just a few steps away across the lawned garden.